These Cinnamon and Sugar Doughnut Muffins are like a sweet hug from Grandma. They have the flavor of a cake doughnut, with the ease of simply making muffins! Make mini muffins, and they’re just like doughnut holes! When I was little my dad had his own remodeling business, mainly finishing basements. He would visit people’s homes, usually in the evenings, to discuss their plans and to give them a bid. If he would get the job…..he would come home with treats!! YUMMY baked goods or ice cream. 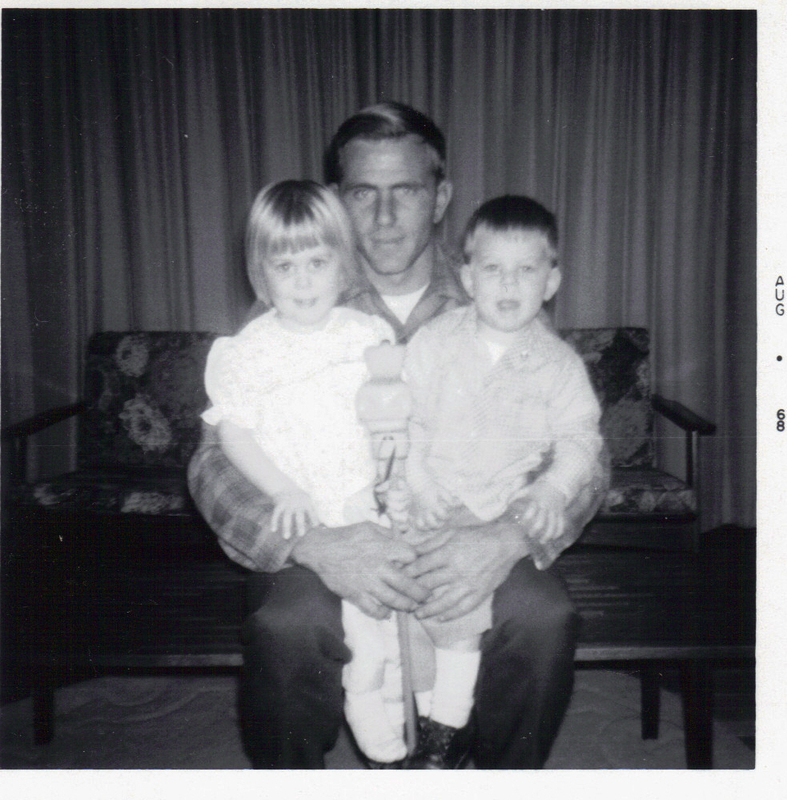 My dad is where I got my sweet tooth from, along with my short stocky legs…..thanks, Dad. Many nights he would bring home doughnuts…….I called them “doan doans”, and I LOVED “doan doans!”……I would eat several. One night dad told me he was going to bring me home just one “doan doan“, and said, “I bet you can’t even eat the whole thing”. Later that evening he walked in with my one doughnut…..it was HUGE! Does anyone remember when Target had bakeries?…….They made these HUGE, 10-inch glazed doughnuts……THAT is what dad brought home to me. My eyes grew HUGE at the site of that beautiful sweet disc of glazed goodness!! I climbed into my chair with a big glass of milk, because doughnuts are BEST when they’re dunked in milk you know…..and I TRIED to eat that doughnut………but Dad won! !……I could NOT eat ONE whole doughnut…..but I sure tried my best. So you see………I’ve always had a deep LOVE for doughnuts! I’ve always been a lover of mornings, especially when certain breakfasts are involved! Specifically, EASY and delicious breakfasts. I love creme brulee baked oatmeal, buttermilk waffles, and homemade doughnut hole muffins! SO EASY. So addicting. Worth waking up for! Doughnut holes are one of my favorite parts of family breakfast. 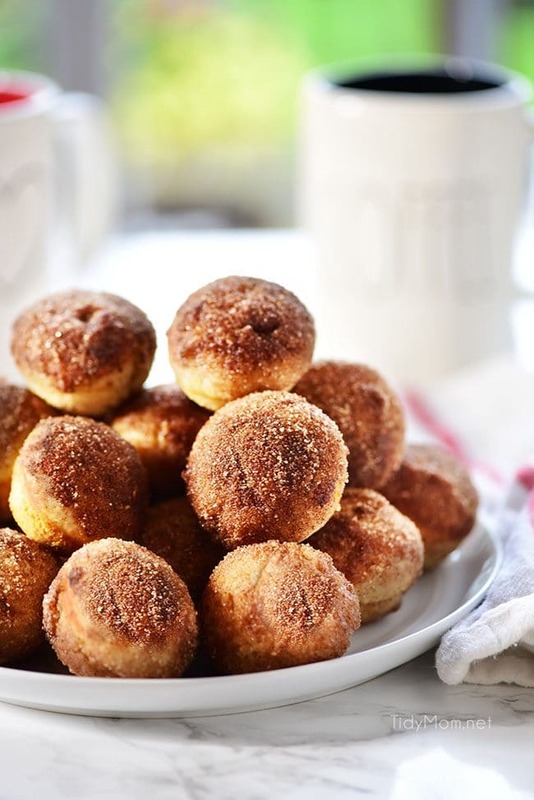 Cinnamon and sugar mini doughnut muffins are such a classic and they never fail to please. I love how tender and sweet these muffins are like an old-fashioned cake donut meets a sugar donut. This muffin recipe is simple and straightforward. You’ll be making these mini muffins every weekend! THIS MINI DOUGHNUT MUFFIN RECIPE IS A FAMILY FAVORITE BREAKFAST TREAT. 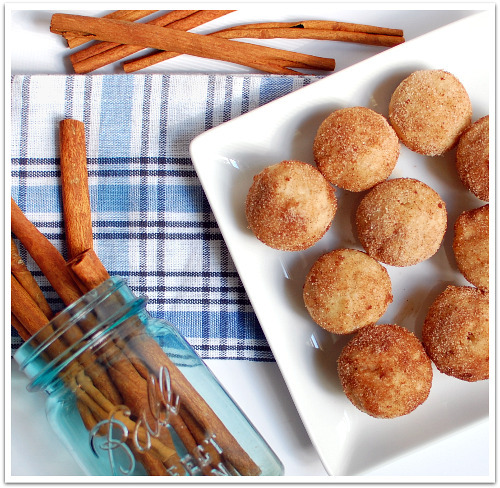 LEARN HOW TO MAKE CINNAMON AND SUGAR DOUGHNUT MUFFIN FOR THE WHOLE FAMILY! Just a few simple ingredients are all you need to make these doughnut muffins. Flour, sugar, baking powder, an egg, you probably have everything you need on hand. No need to sift anything and no mixer is required. You just need a big bowl and a whisk or fork. 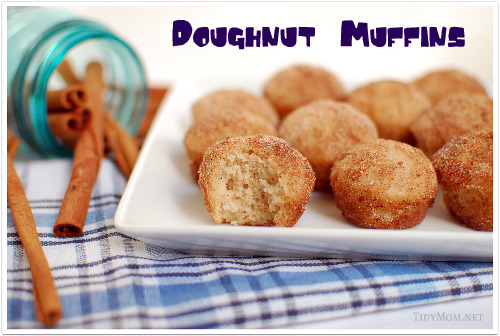 Pour the batter into a mini muffin pan or a doughnut hole pan. If the pan is not no-stick, then be sure to grease it well. Of course, you can also make this recipe for full-size muffins. But I think we can all agree, minis are always better! The mini doughnut holes will only take about 10 minutes in the oven, just enough time to clean the bowl and melt the butter! Once they are out of the oven and cooled just enough to handle, you will dip them in the melted butter and roll in cinnamon and sugar! That’s it!! I told you they were easy. 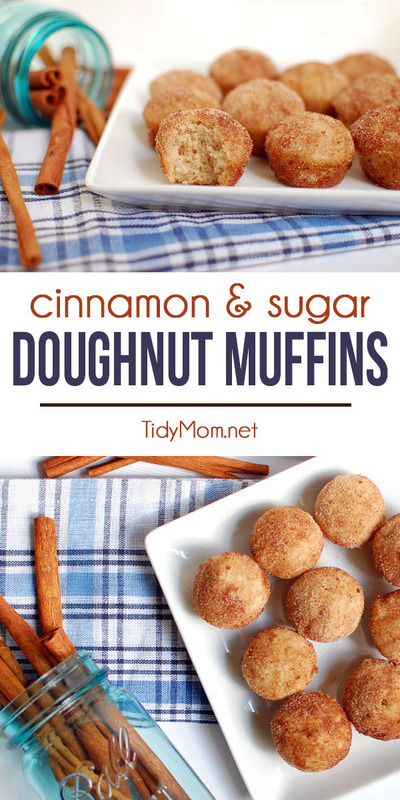 CHECK OUT HOW EASY THIS CINNAMON AND SUGAR DOUGHNUTS RECIPE IS TO MAKE! WATCH THE VIDEO! There’s something about cinnamon and sugar doughnuts that feels even more classic than a classic glazed donut. It’s hard not to get a little nostalgic when eating these ………I love that feeling of comfort. These little doughnut muffins are soft, fluffy and the crumb is amazing! 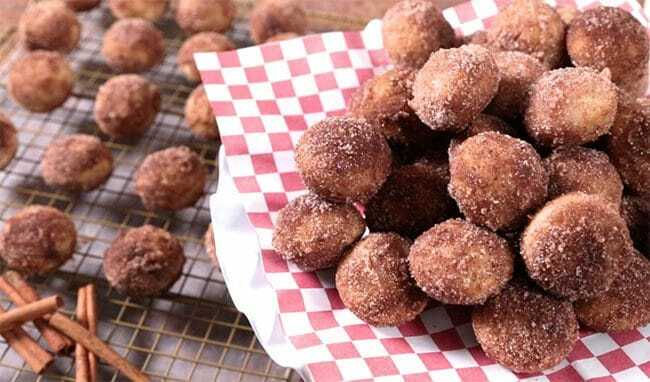 If you like an old-fashioned cake doughnut, you’ll love these doughnut holes. They’re irresistible! Words cannot describe how good these are! I could eat these mini muffins just about every morning, but I love the idea of saving them for weekends to create a family tradition. Wouldn’t these be wonderful with a little jelly or vanilla custard? I may try that next time! My Dad would have LOVED these!! **WARNING – if you make the minis, I am NOT responsible for how many you eat!! Making a homemade breakfast treat just doesn’t get simpler than these tasty doughnut muffins! Like this recipe for Doughnut Muffins? PIN IT! ENJOY THIS CINNAMON AND SUGAR DOUGHNUT MUFFINS RECIPE! Now go bake some mini Doughnut Muffins or doughnut holes! For mini muffins (this is what I made) – spray mini muffin pans with no-stick cooking spray and fill each cup 1/2 full. Bake for 10-12 min. Yields 18 mini muffins. For regular size muffins: spray muffin pans with no-stick cooking spray and fill each cup 1/2 full. Bake for 15-20 min. Yields 8-12 muffins. What a fantastic tip at the end of your post, Cheryl! Aren’t these amazing!! I was fortuante enough to have some made by Jennifer at How to Simplify when we were in PA. These little guys are soooo addictive. I absolutely love the story about doans with your daddy, and what a great photo 🙂 You look a lot like him. Thanks…….I miss my Dad sooooo much!! I LOVED to bake for him, and he LOVED everything I baked!! These look fantastic… and could you be any cuter??!?!?!!!! Good morning! Looks like we’re in the same frame of mind today! It was fun to read your version of these muffins – I always love an endearing story and photos from the past. too funny Brenda…….I’m off to go check out your post! My mouth is watering so much that I’m drooling! I love the story about your Dad, Cheryl! So great! And those muffins…oh man they look awesome! Can I join you for breakfast today? They look addicting! And darling. And yummy. Guess I know what I’m doing A.S.A.P.- making “doan, doans.” LOVE the old photo too! lol………you made me smile Wendy………..
Cheryl….I love this post…and the old picture! 🙂 How SWEET!!! Yes, those muffins are DANGEROUS!!! I’m afraid to make them again! I’m still carrying the first batch on my hips! You were such a cutie!! I am a donut fanatic. I once ate a donut after it fell on the ground and have yet to live it down. That may have something to do with the fact that I was in my 20’s when it happened. But what can I say, it had sprinkles on it and I couldn’t bear for it to go to waste!! I have a recipe like this that I’ve been meaning to try…it’s from the book Confections of a Closet Master Baker. lol…….heck, I would have eaten that donut on the floor even at 45! What a beautiful story!!! Thanks for sharing it with us! YES! this is the PERFECT kind of recipe for that kind of day!! enjoy!! ooooh I like that name!! My mom made these alot when I was growing up – it’s an old Betty Crocker recipe. I have to be careful when I make them because I will eat the whole batch – I make sure there are alot of mouths around so they go quickly. I really do have to try and make these. They look scrumptious! Love the story about your Dad. I know the picture is in B &W (it’s so sweet) but I think you may have also gotten your eyes from your Father. Even in B & W they look like they would be as blue as yours. you are SPOT on Paula…….my dad had BEAUTIFUL clear blue eyes……..and I did get them from him! oh yum! thanks for sharing-can’t wait to make and try these-sounds delicious! I remember my Dad would always buy donut holes from Albertson’s and fresh French bread whenever he was around one of their stores. We didn’t have one where we lived so he would always bring them home from his trips to the bigger cities. I still to this day LOVE donut holes and I can’t resist a loaf of French bread at the store if it just came out of the oven. I am going to give these muffins a try, thanks for sharing!! I mean I can seriously taste them! ANd I just know they are so good with cold mild! What a sweet sweet picture of you with your Daddy. We LOVE these muffins. I don’t make them too often anymore because they’re so addicting. But when I first tried them, I made them several times in the first couple of weeks. I want to try them in mini muffin tins so they will be like little donut holes. What a precious photo…just looking at it, I can tell it’s you! I’ve had this recipe saved for some time now, I guess I better get hopping and try them myself, because they look delicious! So fun. I remember coming home on some Sunday nights and my dad would make homemade potato chips. These look really yummy and we all love donuts and muffins at our house. Looks delicious! I’d love for you to stop by What’s Cooking Wednesday (http://thekingscourt4.blogspot.com/search/label/What%27s%20Cooking%20Wednesday) and share one of your recipes! We’d love to have you, hope to see you tomorrow! Do you have a version of apple cider donuts with the sugar on top? I had some at an orchard recently and they were so tasty! Holy cow – I made a batch of these yesterday and they are already gone! Really Really Yummy. I now know I will need to double or triple the recipe if I want to be able to freeze any of them. A similar recipe has been floating around my family for at least 40 years. I remember my grandmother making these little treats since I was a toddler. I hadn’t thought about those in many many years until I saw them on “The Best Thing I Ever Ate”. Oh how it brought back memories…~sigh~….wonderful memories. The day after seeing this on television, my aunt called from half way accross the county and had stumbled upon the very recipe card that my grandmother had used for so many years. I now keep it as the “inspirational” recipe in the cookbook I am currently writing. Oh how I love that warmth of nutmeg and cinnamon lingering in the air. My Dad loved doughnuts too – he used to bring home ring doughnuts with chocolate icing which are still one of my favourites! I love cinnamon and sugar doughnuts too though and your muffins look wonderful – what a great shortcut to that wonderful doughnut flavour! These look so yummy. I love the little cinnamon sugar doughnuts they sell at Fairs and these look similar- only without all the grease. I also love that I have all the basic ingredients on hand so I can try these this weekend. Thanks for sharing- great pics! Donuts AND muffin in one! Does life get any better than that?? I’m never going to lose this baby weight if people like you keep posting these divine recipes! I saw this recipe on Tatertots and Jello and as a cinnamon-doughnutfan I had to try these out. They’re amazing. I made a Dutch translation on my blog so the dutch bloggers can also try them out and I linked your post. These look amazing. I will try them this weekend. I am having a link party featuring bread recipes made from food storage ingredients. I would love it if you would link up. I made these for a party and they were delicious! Even better the next day. I will definitely make these again. It looks so wonderful and tasty, well I was thinking to make something special during the weekend but now I am sure what to make in the weekend to make it special. thanks to you I was able to learn this awesome recipe.